IT'S TIME TO KICK SOME ACNE! Follow a skin care regimen to prevent Acne and while we’re at it, let’s give blackheads the boot and remove marks, too. Our innovative technologies used to create our acne products are rigorously tested to make sure they achieve great results and leave your skin looking healthy, clean and radiant. CLEAN & CLEAR® Deep Action Cream Cleanser and Scrub removes dirt, oil and make-up deep down to the pores as you wash. Its oil-free formula won't clog your pores and will leave your skin feeling refreshed and clean. 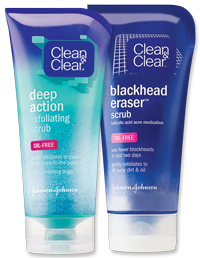 CLEAN & CLEAR® BlackHead Eraser Scrub has unique exfoliating multi-action beads that work to gently remove the trapped dirt, oil and dead skin that can clog pores and lead to breakouts. Three sizes of multi-action beads allow surface exfoliation and a deep down clean. Salicylic Acid, an acne fighting medicine, clears blackheads and helps prevent new ones from forming. Soak up oil, remove shine & Look Fabulous! CLEAN & CLEAR® Oil Absorbing Sheets instantly soak up excess oil and remove shine from your face, without smudging make-up or leaving behind powder. These super soft, silky sheets can be used easily around your nose and other oily areas of your face. Use them anytime, anywhere to remove oil and shine throughout the day. Moisturize… for soft and smooth skin! 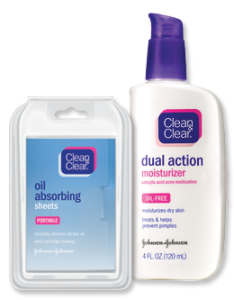 CLEAN & CLEAR® Dual Action Moisturizer combines oil-free moisture with a proven acne-fighting ingredient. It can help to moisturize dry skin while treating and helping to prevent breakouts. It leaves your skin feeling soft and smooth. Include a step in your skin care regimen when you need additional help to clear your pimples fast. We offer breakthrough formulas and you can select the product with the acne fighting medication that works for you! 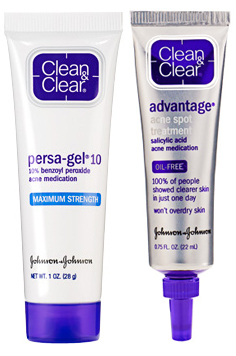 CLEAN & CLEAR® ADVANTAGE® Acne Spot Treatment is a gel with a unique breakthrough salicylic acid technology that dissolves surface oils on the skin allowing acne fighting medication to penetrate into pores and clear pimples fast, without over-drying your skin. This breakthrough formula starts to work on contact to quickly reduce the size and redness of pimples. In fact, 100% of people in a clinical study showed improvements as early as day one!